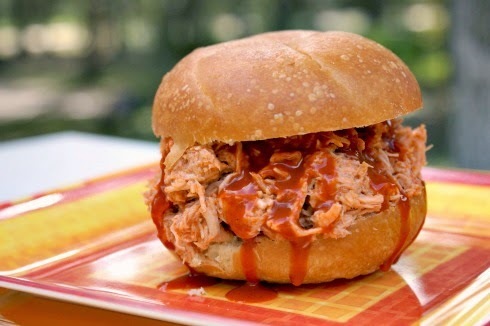 Slow Cooker Buffalo Chicken Sandwiches are super easy to make and have all of the tangy flavors of a classic hot wing. One of the perks of being a student when I attended Florida State University was a free ticket to every home football game. If you're a college football fan you know that that's a pretty sweet deal. I, however, am not a football fan. I went to one (yes, that's right, only one) football game during my four and a half years at FSU. I'm not sure why I never really got the football bug. You'd think after being a cheerleader in high school that maybe the excitement of a game would have stuck with me. Nope. I could honestly care less. Surprisingly enough, I married a guy who is also not a football fan. Considering the fact that everyone I know seems to have a favorite team, I'd say we're a strange breed these days. There is one reason that I wish I was among those that counts down the days to football season and that's the party. I sure do love a good party and football fans know that watching a game with your fellow fanatics is one of the best kind of get-togethers. Game day food is my kind of food. Chips and dips, burgers and wings...sounds good to me! Whenever I cook this recipe I think it would be perfect to serve at a football party. It requires little attention, which is perfect when your hosting and want to watch the game, too! And buffalo chicken? What food says football more than buffalo chicken wings? These sandwiches have all of the tangy flavors of a classic wing. If you have any leftovers (which I doubt you will if you're serving it to a crowd) they are amazing on an crisp iceberg salad with cool ranch dressing or made into a homemade buffalo chicken pizza. Versatile and delicious! Place the chicken breasts in the slow cooker. Top with ¾ of the bottle of wing sauce and the ranch dressing mix. Shred the meat with two forks and continue cooking for 1 more hour to allow the meat to soak up the juices. Serve on toasted rolls topped with the remaining buffalo sauce. I've been on a buffalo kick, these look perfect!